Once again, cable news largely failed to present diverse voices when reporting on the ongoing health care debate, missing an opportunity, yet again, to inform audiences of the personal cost millions of Americans will incur if Republicans pass their bills into law. Over six weeks after the House of Representatives passed the American Health Care Act (AHCA) on May 4, Senate Republicans finally publicly introduced their health care proposal on June 22. The Senate committee that drafted the bill was roundly criticized for its “almost-unprecedented opacity” and lack of diversity. Leading up to that introduction, cable news coverage of the bill didn’t fare much better. And when cable news did cover the bill prior to its release, the guests were almost always white men. Fox News featured 41 guest appearances during discussions of the bill. Of those guest appearances, 37, or just over 90 percent, were made by white guests. Only four appearances, or about 10 percent, were made by African-American guests. 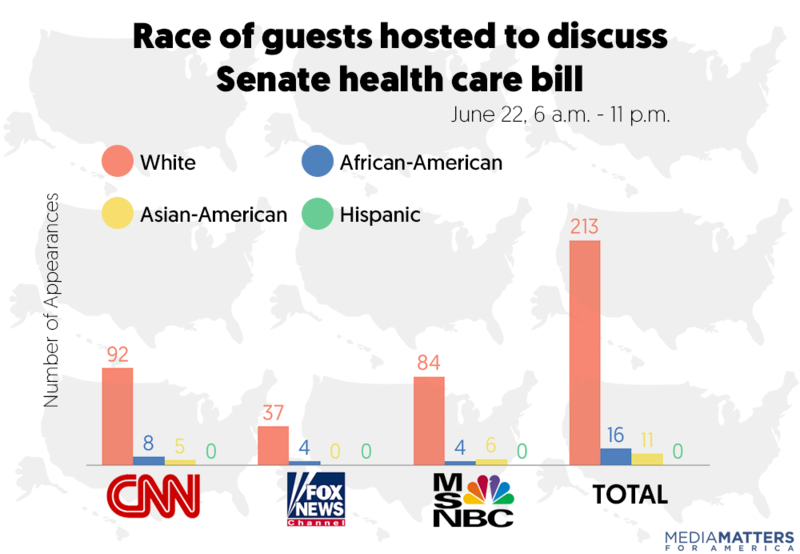 The network hosted no Asian-American or Hispanic guests to discuss the bill. MSNBC featured 94 guest appearances during discussions of the bill. Of those guest appearances, 84, or just over 89 percent, were made by white guests. Only four appearances, or about 4 percent, were made by African-American guests, and six appearances, or about 6 percent, were made by Asian-American guests. The network hosted no Hispanic guests to discuss the bill. CNN featured 105 guest appearances -- 61 appearances by men and 44 by women -- during discussions of the bill, meaning men comprised 58 percent of guest appearances, while women comprised about 42 percent. Fox News featured 41 guest appearances -- 31 appearances by men and 10 by women -- during discussions of the bill. Thus, almost 76 percent of guest appearances were made by men, while only 25 percent were made by women. 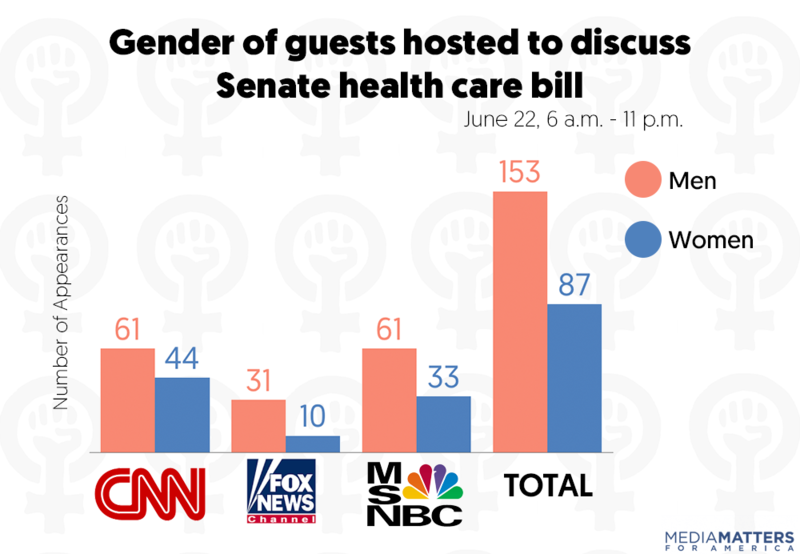 MSNBC featured 94 guest appearances -- 61 appearances by men and 33 by women -- during discussions of the bill, meaning men comprised about 65 percent of guest appearances, while women comprised about 35 percent. It is necessary to include diverse voices in discussions about a bill with such dire consequences. African-Americans, Hispanics, Asian-Americans, women and low-income people greatly benefited from the Affordable Care Act and stand to lose disproportionately if it is rolled back. Diversifying the discussion on cable news will help bring needed attention to the devastating harm that will occur if the Republican bills become law.